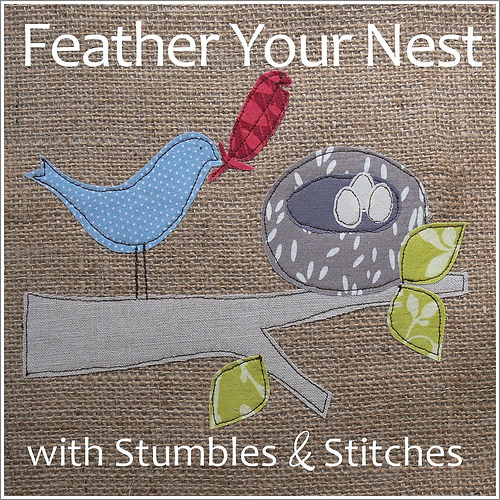 This is my entry in the Feather Your Nest contest, put on by the folks at Stumbles & Stitches blog. I committed to making something about two and a half weeks ago, but I wasn't sure what I'd make. The first requirement is that the entry be something for myself, for my own home -- since I don't make much for myself, I thought the contest would be a good motivator for that. 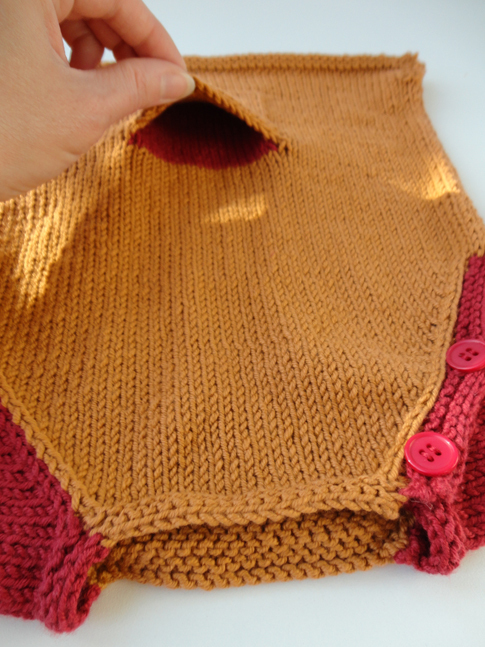 Secondly, it must be made with stitches -- easy peasy (at least for me)! And third, it must use repurposed or upcycled materials -- even though I generally use a lot of upcycled materials, this part was harder than I thought! I thought and thought about what I would make. I considered a throw pillow of felted sweaters as I've made in the past, but that seemed to "Winter-y" to me. I also had an idea for a wool pillow covered in red felted sweater hearts (something I've sketched in the past), but that, too, didn't seem to fit the season. 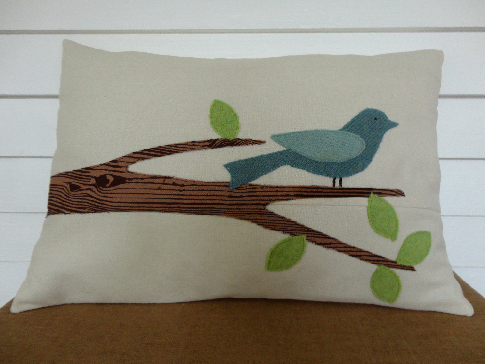 I wanted this pillow to be about now -- about Spring! I bought an inexpensive ($1.99!) tea towel with birds and flowers on it that called out "Spring" to me (see below), but I just wasn't sure how I'd use it for this project... so I kept thinking. Then yesterday, it hit me. I have two pairs of white wool trousers that once belonged to my grandmother, and I've been wanting to repurpose them. Then I came across some of the Joel Dewberry wood grain fabric in my stash (I love that fabric! ), and had the idea to use it for a branch. The idea of using my sweater stash for a bird and leaves came next. After all, my daughter's been talking about birds in preschool all week and the contest is titled "Feather Your Nest." 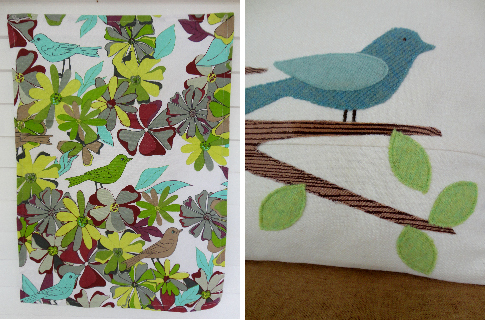 The bird's shape was inspired by the birds on the tea towel. I even found a slightly-coming-apart pillow form in the basement that just needed a bit of reconstructive stitching. So, yesterday I applied the fusible backing to the applique fabrics and cut everything out. I was so proud of myself -- all I had to do was stitch it up the next day. Yeah, I know. Pretty similar! I now realize that the image was subliminally in my head all along as I designed my pillow yesterday. Still, it is not exactly the same (my son pointed out that mine doesn't have a nest... or a feather! 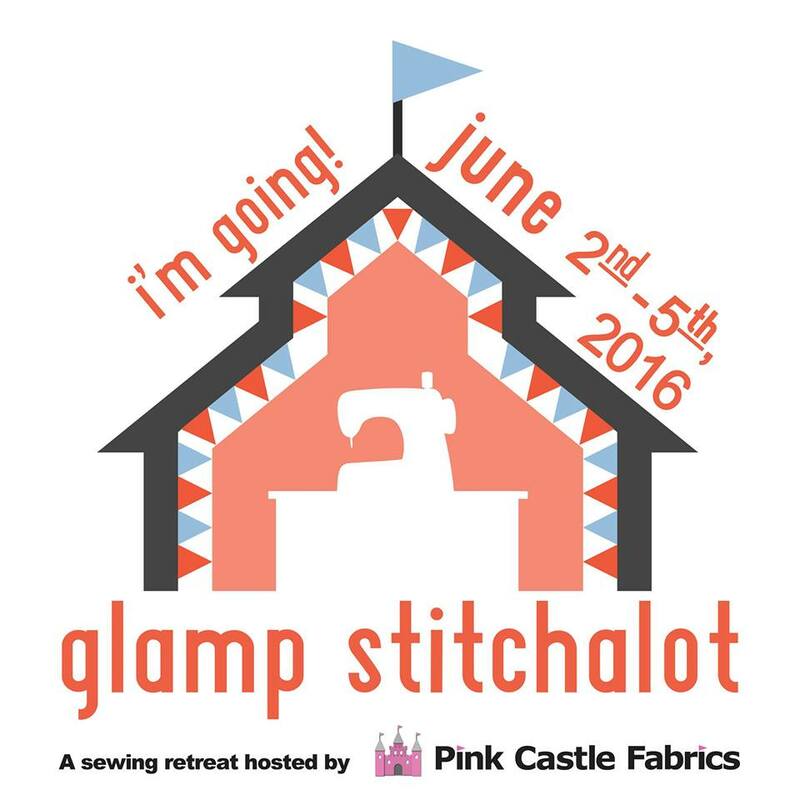 ), and I did really like my design... so I stitched it up anyway and am entering it in the contest. I'll definitely use it in my house, even if the base color is an impractical white. I like the Spring-like feeling it evokes and the fact that it repurposes so many materials. Fabric, fabric, and more fabric. 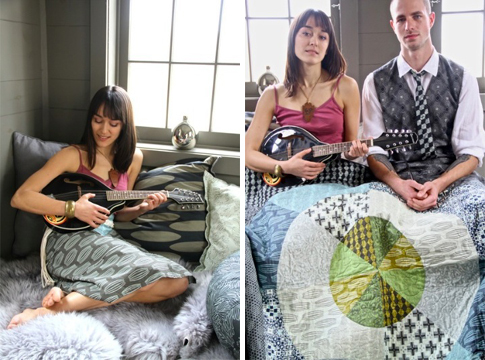 I'm obsessed with this new line of fabrics by Parson Gray (aka David Butler, also known as husband of textile designer extraordinaire, Amy Butler). It's called Curious Nature and is full of lovely muted, earthy colors. 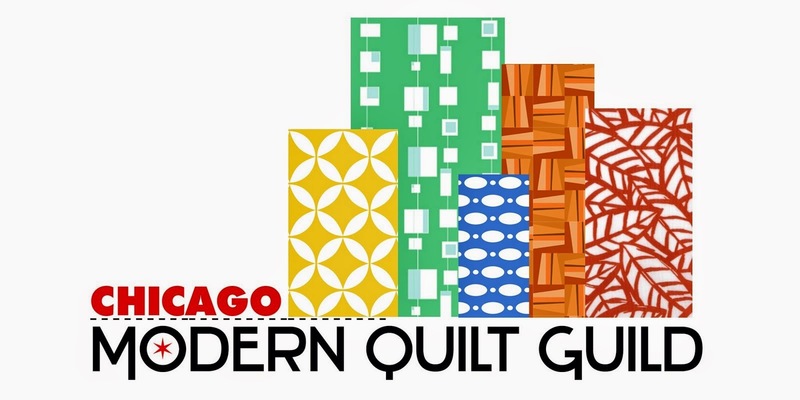 It could be perfect for my first quilt, don't you think? 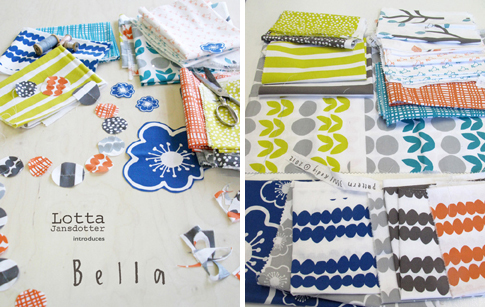 Or I could wait until August, when Lotta Jansdotter's newest fabric line, Bella, will be released. Such happy colors and motifs! Of course, I love pretty much anything by Lotta. If you're at all interested in how a line of fabric gets created (as I am), Lotta has a great post on her blog about the process of designing and producing this line. In the meantime, while I decide which of these beautiful fabrics I need (How about both?! 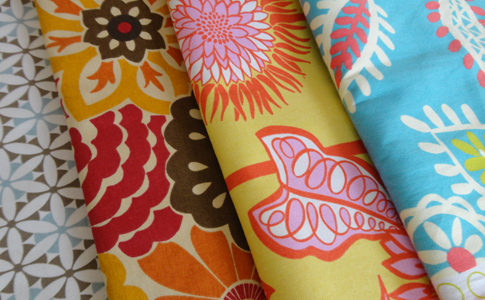 ), I picked up these new home dec fabrics from Joann's for making aprons and bags. I like the scale and colors in their Modern Essentials series... and they were on sale for 50% off. I'm preparing for fairs in May and June, so I gots to be makin' the goods!! You may see some of these prints in the shop soon. Finally, I would really, really like to enter this fabric design contest, sponsored by Robert Kaufman Fabrics and Spoonflower. But other than thinking about it a lot, I haven't actually put anything on paper... or computer... and entries are due tomorrow. I'll let you know if I manage to pull something together. I also have a magazine deadline this week, as well as party favors, decorations, and at least one ambitious cake to make for my baby girl's 5th birthday! I don't knit so often these days. Sewing is so much faster... and more immediately gratifying. I do love the process of knitting. It just takes so loooong. And, in this case, it really did. 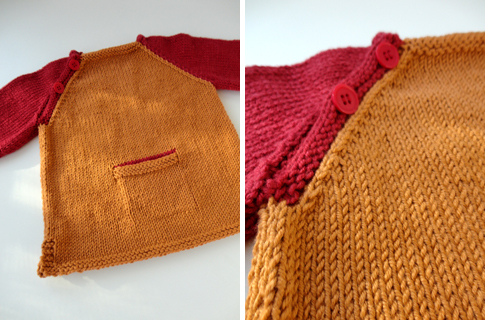 I began this little raglan sweater for my daughter just after she was born. 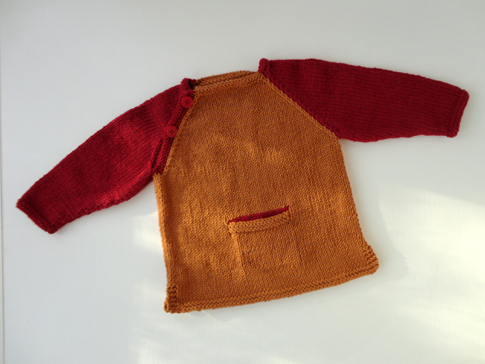 When she grew beyond the size of the sweater before I had completed it, I decided it would go to my nephew instead, who is 15 months younger. Fast forward to now. My daughter will turn five later this month, and my nephew is three. The sweater went to neither of them. I finally found occasion to finish it, though, about two weeks ago. I needed to donate something to a silent auction -- a fundraiser for my daughter's preschool -- and I remembered this project. So I pulled it out of it's dark hiding place, added the buttons, and sewed the little pocket closed. It took all of 15 minutes. And it's finally finished! At last! I love coloring Easter eggs. I always have. I love the way a simple white egg is transformed into something so bright and lovely, so evocative of spring. 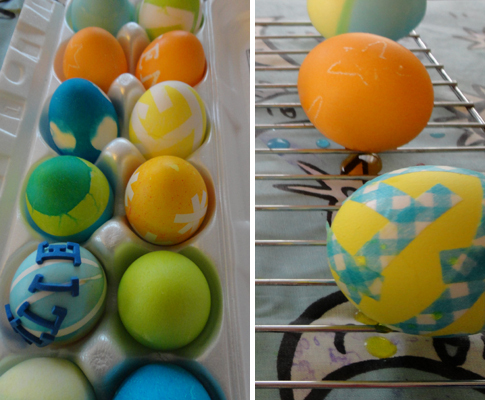 As a kid I remember drawing elaborate patterns with crayon on eggs, before dipping them into the dye. And I remember my dad drawing each of our portraits (yes, on the eggs), then trying to color them just long enough in pink dye to look kind of like our pink skin. Often, they looked instead like we had been out in the sun too long! But we loved the effort he put into each careful drawing, my sister and I giggling over the results. 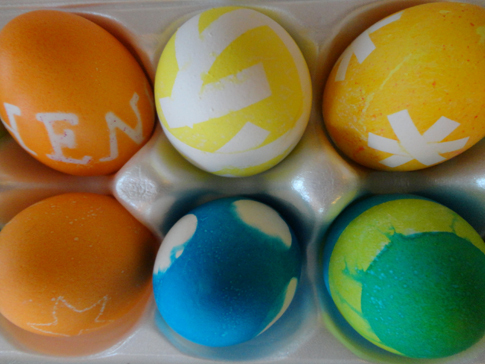 On Sunday afternoon, my son and daughter and I sat down to dye eggs. My son is careful and meticulous like me. My daughter loves the transformation, throwing eggs into dye baths with abandon, just to see the surprising results. This time we used washi tape (regular masking tape would work fine, too), rubber bands, round stickers, and a white crayon to decorate our eggs. I especially liked the unexpected results, such as the way the pink dye (only the pink!) created a speckled finish for some unknown reason, and the way the color seeped behind the stickers and some of the tape for a tie-dye effect. My son was pretty disappointed about the latter, since he had a fully formed idea of how he wanted his polka-dot egg to look! Now my daughter asks every day if we can dye eggs again. I promised we'd do it again tonight, and I expect we'll find another time, too, before Easter arrives. It's a good thing my family likes hard-boiled eggs! P.S. 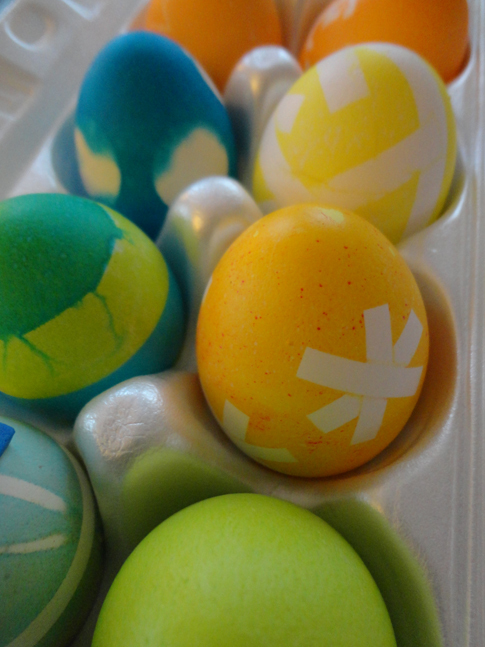 : My overall favorite is the asterisk egg! I dyed it in pink first (to get the speckle effect), then in yellow (for a nice warm shade of orange -- my favorite color!). But, really, I love them all.